Sometimes writing reviews about book I really enjoy are the very hardest to write, particularly if there’s a lot going on in the story. Hopefully I have written something that does this book justice. The Low Down: Ten years ago, the Garretts moved in next door. As soon as Samantha Reed’s mother, Grace, saw them, she said: “I hoped we could have avoided this.” “This” is lots of kids, toys in the front yard, and the grass not mowed regularly. Chaos. The Reed household is perfect: twice-daily vacuumed carpets, lemon rind in the ice cubes, clothing stored by color. Perfection. Mom didn’t approve of the Garretts, so they were off-limits. And since Samantha and her sister, Tracy, went to private school, their paths never crossed. This doesn’t mean that Samantha isn’t addicted to watching this family in secret. Long ago, she discovered a ledge outside her window where she would sit and think and gaze at the stars – and the Garretts. She knew all of their names, took in the controlled bedlam, watched the love expressed. Samantha’s dad left when she hadn’t even been born yet, and her sister, Tracy, was only a year old, so her world is a bit different from that of the next-door neighbors, though her mother’s trust fund means they do more than fine. Then Samantha meets Jase, and her world is changed as she is immediately drawn into the warm and loving gravitational pull of the Garretts. Is this what a family is really supposed to be like? Suddenly, everything starts to change: Tracy is gone all summer working on the Vineyard; Grace comes home with a new campaign manager-slash-boyfriend; Samantha’s best friend, Nan, has a secret that may sink their friendship; Nan’s twin, Tim, is continuing on his path of self-destruction. Worst of all, there is an event so horrible, it threatens to not only ruin her mother but ruin a family as well. Will Samantha have to sacrifice what she wants for the greater good? Best Thang ‘Bout It: Sometimes when books have too many threads, a reader can get lost or all the different stories never gel or come together. There are several issues going on in this story – each of the main characters has something going on that makes the book deeper and more resonant. Everything comes together and nothing gets lost or short-shrifted. This book feels like how real life is. While I really love the main romantic leads, my other absolute favorite is Tim. Screwed-up, ballsy, addicted Tim. He’s an irreverent, cocky, swaggering smartass with a heart of gold. Many of the best lines are his. I am so glad the author doesn’t shy away from his 3D personality that jumps off the page; instead, she throws him in the reader’s face just as he is: f-word, smoking, drinking and all. He needs a big skweenchy hug and a time machine where he can go back to be born to parents who deserve him. While the seriousness of the topics here can’t be denied, it’s the humor, devotion and love that makes us care. The Bottom Line: You’ll laugh, you’ll cry, you’ll read it again as soon as you finish it. 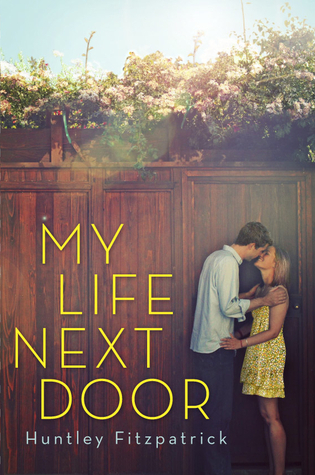 My Life Next Door by Huntley Fitzpatrick was published June 14, 2012 by Dial Books. Ink and Page picked this book up from the library, so no one had a choice about whether it was reviewed. You Might Want to Know: As mentioned, there is liberal usage of profanity. There are also sexual situations.